Meet Ruthie: a recently widowed New York City Jewish grandmother who doesn't necessarily come to yoga with the most open of minds. But when her granddaughter Stephanie gives her a year of yoga classes as a gift ("I think it will help you grieve, Bubby"), she doesn't want to risk offending her. At first, Ruthie is skeptical of yoga and its promise of renewal, healing, and transformation ("You know what's wrong with yoga? They haven't mastered the art of kvetching!"). She can't resist poking fun at some of the new words and rituals she encounters, translating the exotic language of Yoga into the more familiar idiom of her native Yiddish culture. As Ruthie's journey progresses from week to week, she forges new paths, new postures, and unexpected friendships, slowly overcoming her grief. Yiddish Yoga is a poignant, witty, and human story of love in its many expressions—between grandmother and granddaughter, between an older woman and her younger yoga teacher, between a widow and her beloved husband of fifty years. As Ruthie learns to let go of the past without forgetting, she shows us how to embrace the present with new vigor, strength, and courage—and, above all, makes us laugh. Lisa Grunberger holds a Ph.D. in Comparative Religions from the University of Chicago Divinity School and teaches writing in the English department at Temple University in Philadelphia. She has taught yoga for many years, and is also a published poet and performer. A native New Yorker from Long Island who grew up with an Israeli mother and a Viennese father, Lisa was immersed in Yiddishkeit from a young age. 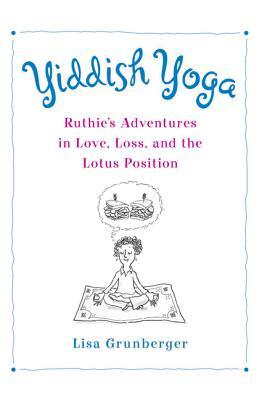 Yiddish Yoga is her first book.